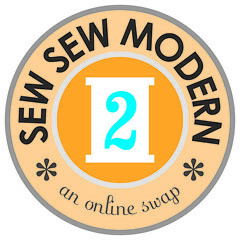 I finished up my swap items for Round 2 of the Sew Sew Modern Swap, just in the nick of time to send them off to my partner under the deadline. 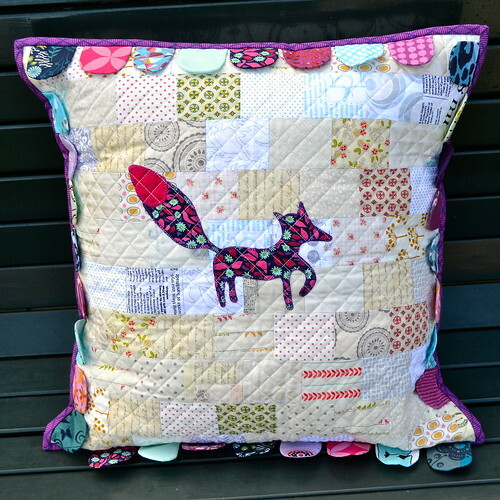 The large item is this pillow cover - a fun bright fox (pattern from Kajsa Wikman's book Scandinavian Stitches) on a low volume background. To add interest, I made a whole lot of little curved tabs to go around the edge, using the colours in the Anna Maria Horner print I used for the fox. 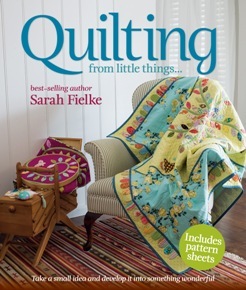 The tabs around the outside are totally inspired by the tabs on Sarah Fielke's Whirligig quilt, the pattern for which is in (and on the cover of) her book, Quilting from little things. The back is a fun cotton drill from Spotlight (designed by Prints Charming). The slightly heavier fabric is perfect for backing a cushion - it's sturdier than quilting cotton but not as thick as home dec fabric so nice and soft for snuggling up with. The binding is a print from the Heaven and Helsinki collection - it's the perfect shade of purple, and I think I might have to buy more! 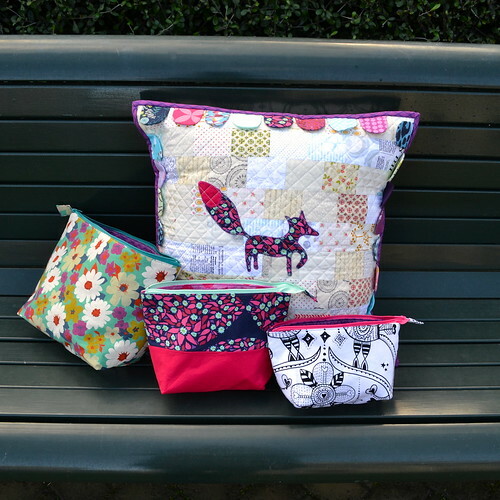 I also made a set of co-ordinating, but not completely matchy-matchy open wide pouches using my favourite Noodlehead tutorial. I have to thank my Mum for some last minute help with these - I was really running short on time! I'm a little sad to see these things go, and I hope my partner will like them! Now I can't wait to receive my swap items! 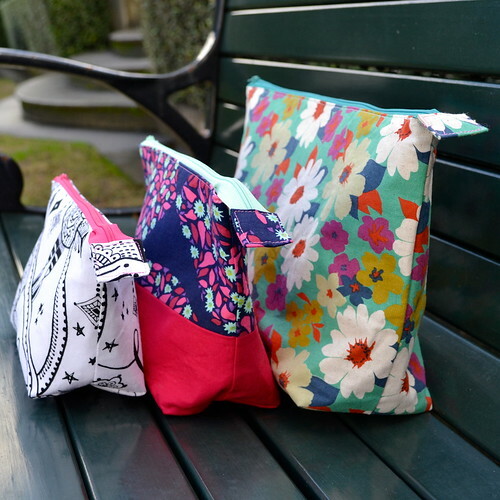 Have you been indulging in any swap sewing lately? You put so much work into these I'm sure your partner will be thrilled. I love the pouches not being matchy matchy but totally coordinating. Lovely work. Fun! I love the tabs on that pillow, it adds a nice touch. 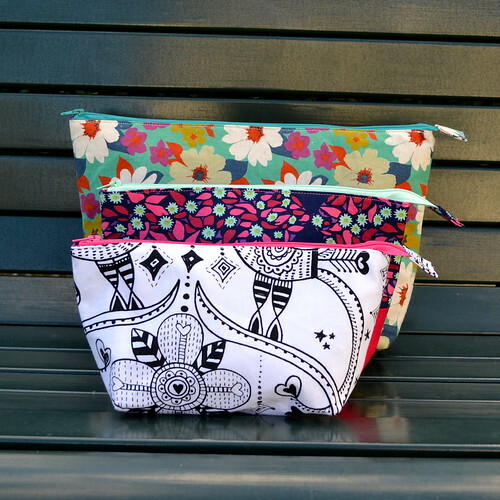 And the pouches are gorgeous, that Melody Miller floral is one of my favorites. These are fantastic. I love the fox! What a great swap. Whoa! What a lucky partner! I heart the fox pillow. Its really sweet and funky all at the same time. Love how it turned out. Lucky partner! Wonderful projects. 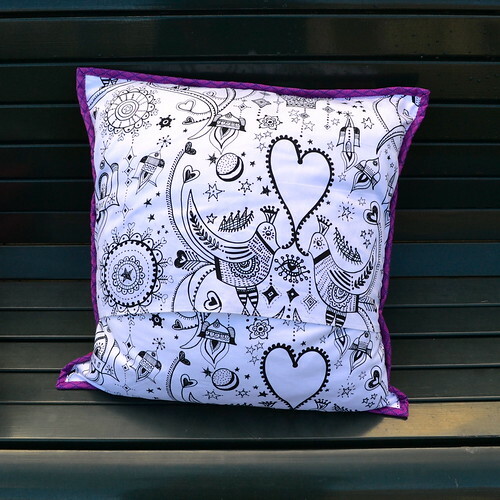 Love the little tabs on the cushion! What an awesome pillow!! Somebody sure is lucky! I love your pillow and pouches! So well made and beautiful! Love your foxy pillow. The tabs are wonderful! I love the fox pillow! Wow, that pillow is awesome!